My account gained 0.5% this week, while SPY fell 1.6%. This ended up as an “OK” week, but on Monday it had seemed like it would be “best week ever”. I am back to the same account balance as on June 10th. Business news: Various reports are conspiring to create the impression that the double-dip recession might not be starting just yet. I predict a “relief rally” that will last about two weeks. Might not start until the week after next, though. Daily progress table: The table below has been revamped. I think the new format is less likely to coerce me into making bad trades, but it is still too complicated and needs further simplification. Shares, options, and dividends are now shown separately. For options, the naming convention is “AUp7½”, which means an option that settles in AUgust, is a put (rather than call), and has a strike price of $7.50. Each daily-gain cell shows the day’s closing %gain-so-far as the main number. For puts and dividends, the daily figure is shown as an addend for the share’s %gain (I *think* I’ve got the math right on this). The upper-right number is the %account for this investment (minimum 0.1% for very small holdings). The lower-right number shows the percentage of total purchase that I still own (or blank for 100%). After part of the investment is sold, the daily gain varies less because the gain for the no-longer-owned part has become fixed. When an investment is completely sold, the main number becomes gray and the actual gain appears in the “Results” column. (These gains can be very large for puts, but their %account is very small.) For shares, the daily %account decreases three days later when the sale settles; for puts the sale settles the next day; for dividends it varies (the expected settlement date is shown in the “Results” column). Settlement is shown by a red upper-right number, while a green number indicates a new purchase; the number can vary slightly while remaining black, as the investments in the account change size relative to each other. The “owned” percentage gets smaller when an investment is partially sold and gets larger when more is purchased. When puts are completely sold, the owned amount goes to 0% and the daily figure stops changing (add this figure to the share-gain to find the overall gain). When shares are completely sold, the owned amount does not decrease; instead, the daily gain continues to fluctuate to show whether I picked a good day to sell. For dividends, the owned amount goes up when dividends are accrued and back down to 0% when they settle. When the daily price for a put is so low that the put-price plus the share-price is less than the strike-price, a red underline appears and the “me” daily account balance is adjusted upward to compensate. The max-loss shows the minimum value that shares+puts must have, but Schwab doesn’t handle this properly. DRETF: Sold last Friday; settled on Wednesday. The fourth dividend payment is due August 15th. DRETF has recovered some, but it’s still below its 200-day moving average. I’m not buying it back yet. TLT: Sold last Friday (although waiting would have been better); settled on Wednesday. The third interest payment settled last Friday, but arrived after I wrote last week’s report so I’m noting it as having settled on Monday. Final gain: 8.1% shares, 1.0% dividends, -3.2% puts, total 5.9%. Since all %account values are now zero, the TLT investment is complete and will not appear in next week’s table. FRED: Sold the puts on Tuesday, which turned out to be the worst day of the week for a put-sale because the stock price was at its maximum. Sold the shares on Friday at midday, but then the price went up 1% after I sold. Just overall bad timing. Final result: -19.2% shares, 8.6% older puts, 2.9% newer puts, total 7.7% loss. This is worse than the 5.8% loss I would have received by exercising the options. RWM: Bought more last Friday, raising this invesment to 19% of account and 82% of it is still owned. This thing basically performed as expected this week—it was everything else that reduced my profits! Got rid of the trailing sell-stop on RWM and replaced it with buy-stops on SCHA, which is safer because SCHA has no transaction costs for Schwab customers. On Monday I bought puts because I had to take my wife to the emergency room and couldn’t watch the market. Then I sold the puts on Tuesday, which turned out to be an especially bad day for put-sales. SCHA: The shares sold last Friday settled on Wednesday—but on Wednesday I bought new shares, which were sold this Friday and will settle next Wednesday. The new shares were sold at a profit, which reduced my overall loss on SCHA from 6.6% to only 0.2%. I have orders on file to buy more shares on Monday, if the price rises; I am basically using SCHA as “ballast” to counteract RWM during periods when the market is rising. 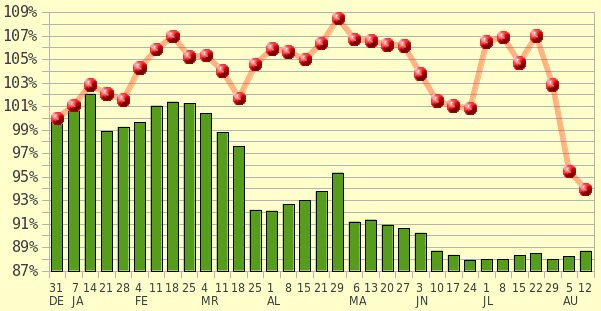 SBB: Shares sold last Wednesday, Thursday, and Friday were settled this Monday, Tuesday, and Wednesday. Should have waited and sold it later. SBB is complete and will not appear in next week’s table (unless I buy more). IAU: Looks like it peaked on Wednesday at $1805/oz, so I bought a put on Thursday, locking in my gains. Some pundits think gold will drop to the 50-day average ($1600/oz) and then bounce back up; others think it will go to the 150-day average ($1500/oz) and bounce; some admit they don’t know whether gold will bounce any time soon. If it doesn’t bounce by September 17th, I can exercise the option and get a +3.1% gain. RPRX: Not going anywhere. I said I would give it until September. FXF: Fell 3% and triggered my stop on Wednesday, but then went back up so I bought replacement shares at the same price—which then gapped down 4% on Thursday! I barely eked out a profit for the two sets of shares. 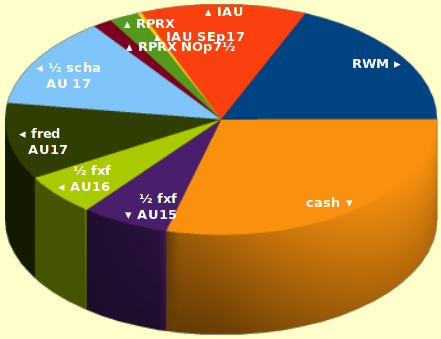 On the pie chart, you can see that my main investments are RWM (a bet that the Russell 2000 stock-average will go down) and IAU (which holds gold bars in a warehouse). The thin yellow line is the put for IAU, green for the RPRX shares, brown is the put for RPRX. All the remaining pie segments are already sold and will settle to cash on the dates indicated. The DRETF dividend does not appear on this chart because Schwab does not include accrued dividends in account balances until they actually settle.